What to do and where to shop in Milan. Spend 24 hours in Milan, Italy's most stylish city. Do your shopping at Cartier, Cerruti or Versace. 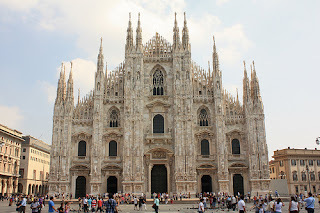 Indulge in Italian food and reward yourself with Milan's rich culture. 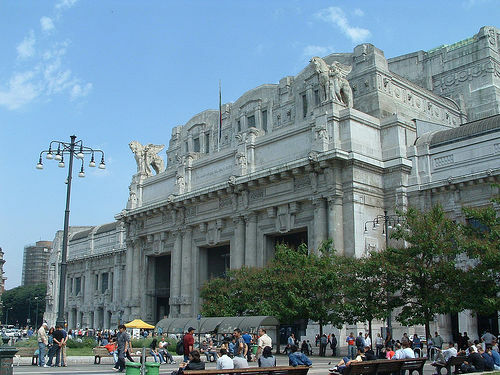 Milan is the shopping capital of northern Italy. Throw in a handful of monuments, sprinkle with a bit of culture and you have 24 hours of sheer pleasure. Gucci, YSL, Vuitton logos, handbags, fashion and accessories are no fakes. They are all the real thing. Set a limit on your credit card if you want to be able to pay your hotel bill. Milan Central Station is one of the most beautiful stations I ever saw. It's imposing, monumental and full of interesting details; winged horses, figures in Roman garb, pilasters, medallions and reliefs. Wide stairs and long escalators lead to the magnificently vaulted booking hall and concourse. Leonardo da Vinci painted his Last Supper on the walls of the Church of Santa Maria della Grazie. The colours faded over the centuries, but this fresco has been restored beautifully. The painting captures the moment when Christ tells that there is a traitor among them. The fresco became famous because each of the apostles acts differently. Some show anger, others, shock or anger. The Ossuary or Skull Chapel is one of my other favourite places. The walls in the chapel in the Church of San Bernardino in Piazza S. Stefano are decorated with some 3,000 human skulls and bones, laid out in intricate patterns. The chapel is open from 7:30am to noon and 1pm to 6pm; closed Saturday and Sunday afternoon. 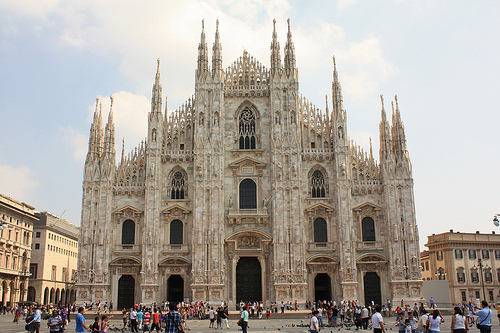 Start the day at Piazza Duomo and Milan Cathedral bristling with slender turrets and pinnacles pointing straight into the air. The white sparkling façade looks if it has just been cleaned. Construction began in the 14th century and it took five centuries to complete. Countless flying buttresses, one hundred and thirty-five spires and nearly three thousand statues, no wonder it took so long to complete. Look high up at Madonnina, a gilded bronze statue, crowning the main spire. Walk around the cathedral so that you can see it from all sides. This impressive building is the third largest cathedral in the world. Number one is St Peter in Rome, and number two is Seville's cathedral in Spain. Let's now go inside. The first thing you will notice is the temperature: nice and cool and secondly fifty-two 52 pillars, each 3.50m in diameter. Admire the inlaid marble floors, the largest organ in Italy, a magnificent stained glass windows. Climb the steps or take the lift to the roof to marvel at the 2,245 statues on the roof. 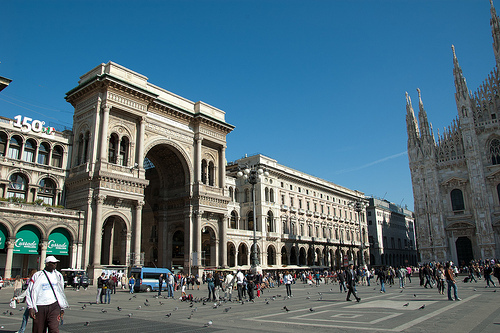 When you get down, walk across Piazza Duomo to Galleria Vittorio Emanuele, an elegant shopping arcade finished in 1877. Right in the middle, under the copula, is a mosaic of a bull. Dancing on its masculinity brings luck and fulfills all your wishes, but I was told only for men. It is now time for refreshments. 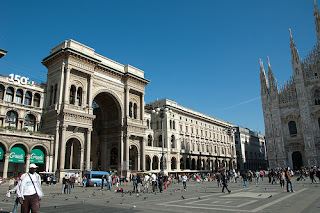 The best place is Bar Zucca, at the main entrance of Galleria Vittorio Emanuele on the Piazza Duomo side. It is still too early for una zucca, an alcoholic drink made from rhubarb, with a slight medicinal taste. But they also serve cappuccino, café latte, and espresso. The bar was favoured by Guiseppe Verdi, who used to stop here for a drink after concerts at the Scala, which is just around the corner. When you have finished your coffee and have done enough people-watching, walk to Piazza della Scala to see the famous Theatro alla Scala. You can try to get tickets for a performance, because the box office is open from 12 to 6pm. Visit Museo Teatrale alla Scala, where you can see theatre sets and costumes. Next to the Scalla is Via Manzoni; Guiseppe Verdi lived and died at number 29. Legend has it that the street was covered in straw so that he could compose without being interrupted by the noise of horses and carriages. Walk along via Dante (or take a taxi) to Castello Sforzesco, a perfect place to rest your weary feet. The castle was built in 15th century and looks like a brick cube. Give the museum a miss, unless you are a huge fan of medieval paintings. Have a picnic lunch in the park next to the castle or go to one of the restaurants nearby. A three-course menu will set you back €20 and extra for drinks. Let's leave the crowds behind. Take a taxi or hop on the subway. Get off at Garibaldi F.S. (line M2). Cimitero Monumentale is right in front of you. If you are interested in Art Nouveau and Art Deco styles, you will certainly like this cemetery. All graves are decorated with sculptures in these styles. Many graves have framed photos of the deceased which makes a visit very touching. 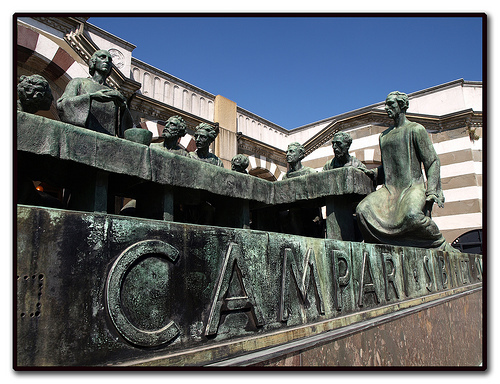 Cimitero Monumentale is like a museum, even better because it is in the open, very quiet, and peaceful. Be sure to have a look at the life-size sculpture of Leonardo da Vinci's "Last Supper," the leaning Tower of Pisa, and the rock with a plowing farmer. As with all museums and monuments, the cemetery is closed on Mondays. Time for more mundane matters: shopping. You will find the Italian couturiers in Via della Spiga at No 4 Bulgari and No 14 Cerruti, and in Via Monte Napoleone, at No 5 Gucci, No 11 Versace, No 14 Vuitton, and No 16 Cartier. Continue your shopping (or browsing) in Via Sant'Andrea, No 9 Armani, No 10 Chanel, and No 11 Kenzo. If your budget doesn't allow you to shop here, go to Corso Buenos Aires, full of affordable shops and outlets. Take the subway to Porta Genova in the Navigli district. Walk along Via Vigevano to the wharf and explore the clubs, bars, and restaurants. Between one aperitif and another, you serve yourself from the buffets that are provided at the happy hour. You will have no problem finding a restaurant, as there are plenty. A big bonus of this area is that there are often live concerts in the evening. Mivvy, I'm going to be in Milan March 31. I would like to attend a modern dance performance for another cultural event. Any suggestions? Hi! Thank you for sharing your thoughts about last supper reservations in your area. I am glad to stop by your site and know more about last supper reservation. Keep it up! This is a good read. You have such an interesting and informative page. I will be looking forward to visit your page again and for your other posts as well. The Eastern Orthodox use the term "Mystical Supper" which refers both to the biblical event and the act of Eucharistic celebration within liturgy. Make the most of your precious Italy vacation time - plan ahead. Weekend in Italy brings you access to all of the best Milan museums, tours, and even guaranteed tickets to see Leonardo da Vinci's Last Supper. Figure out all the details now before you get there and you’ll get to see and enjoy so much more! That’s the idea behind our site.